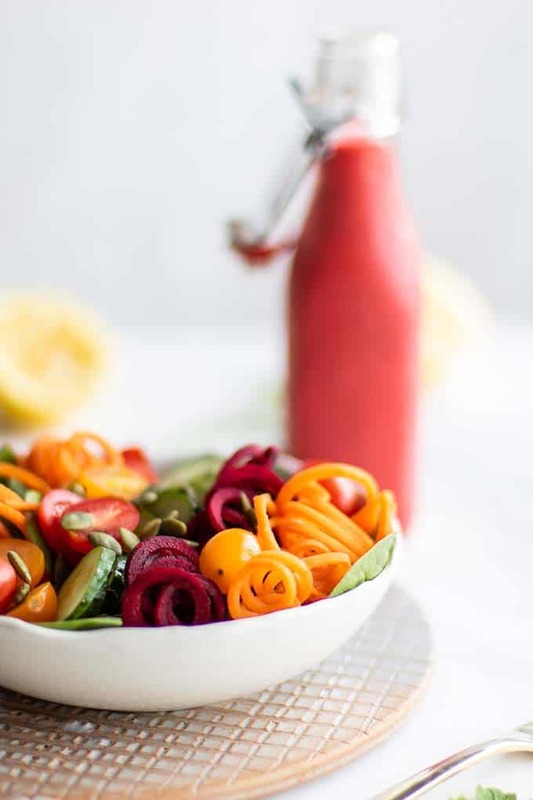 This Summer Raspberry Vinaigrette Dressing is the perfect thing to liven up your summer salads. I like to keep my dressings simple, so this is one made with only 5 ingredients. Enjoy this raspberry vinaigrette salad dressing on side salads, or entree salads with chicken or salmon. A Summery Homemade Salad Dressing to Top EVERYTHING! They are filled with ingredients I don’t want in my food — excess sugars, sodium, and preservatives. A typical store bought dressing has over 20 ingredients. 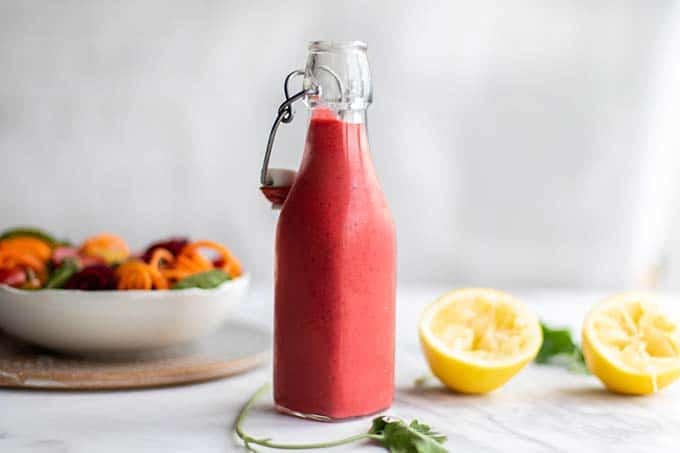 This beautiful raspberry vinaigrette dressing has only 5 ingredients — and they are all things you probably have in your kitchen (you might need to pick up raspberries, but I certainly always have them in the summer!). Raspberries, lemon juice, white wine vinegar, olive oil, and honey. Sometimes I add a pinch of salt to bring out the flavors more, but that is a totally optional addition. This bright pink dressing adds a special touch to salads. I have used this at summer dinner parties to dress up otherwise basic salads! Greens, with feta cheese, some tomatoes, some spiralized carrots and sliced cucumbers, and believe me, everyone will think you’re a kitchen genius. I make most of my sauces and dressings at home because of those reasons. They are cheaper, and you get to choose what goes in them — you control the salt, and the type and amount of sweetener. Most of the dressings I make are included in the recipes for salads, but I have a couple favorite salad dressings here. I make vinaigrettes all the time. 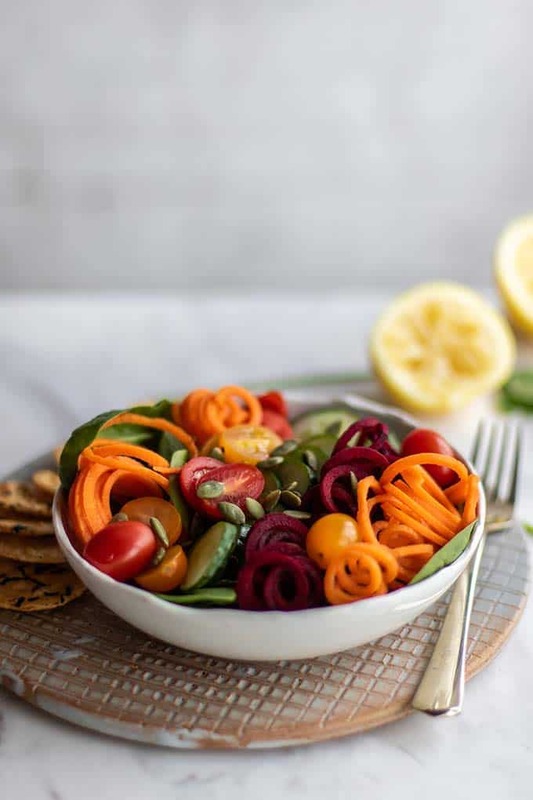 They take minutes to make, and having a jar ready in the fridge makes salads that much more enticing when it comes to meal time. 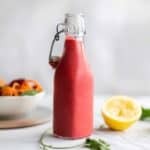 Having this healthy raspberry vinaigrette dressing in the fridge is a huge reminder to include salad with my meals! I seriously contemplated having a salad for breakfast because this dressing was staring me in the face. Raspberry Balsamic Vinaigrette: Sub balsamic vinegar for the white wine vinegar in this recipe. Tahini Lemon Vinaigrette: Leave out the raspberries, and use 3 tablespoons of tahini. Strawberry Vinaigrette: Use frozen strawberries in place of the raspberries. Raspberry Walnut Vinaigrette: Add 2 tablespoons of toasted walnuts to this recipe and process until smooth. Mix up the Oil Used: I use olive oil more than anything else in my kitchen. However, walnut oil is amazing in salad dressings, and avocado oil is also a healthy choice. Homemade dressings just taste better — so once you’ve tried making one and realizing how stupid simple they are, you’ll be hooked like I am! I recommend using frozen raspberries in this recipe. You can use fresh, but frozen raspberries turn the dressing a bright pink color, while fresh make the dressing red. The frozen raspberries also make it lighter in texture. Add frozen raspberries, olive oil, lemon juice (fresh squeezed, if possible! ), white wine vinegar and honey to a blender, and process until smooth and bright pink. Add a pinch of salt if desired. This is optional, but I like the extra flavors brought out by about 1/8 teaspoon. Grilled Chicken or Fish: Take some grilled meat, add it to a bed of greens, and top it with this summery dressing for a simple but delicious meal. Lettuce Wraps: Maybe start with this easy chicken salad recipe. Sub raspberries for the grapes, or just omit, and use this dressing drizzled on top rather than the tahini dressing. 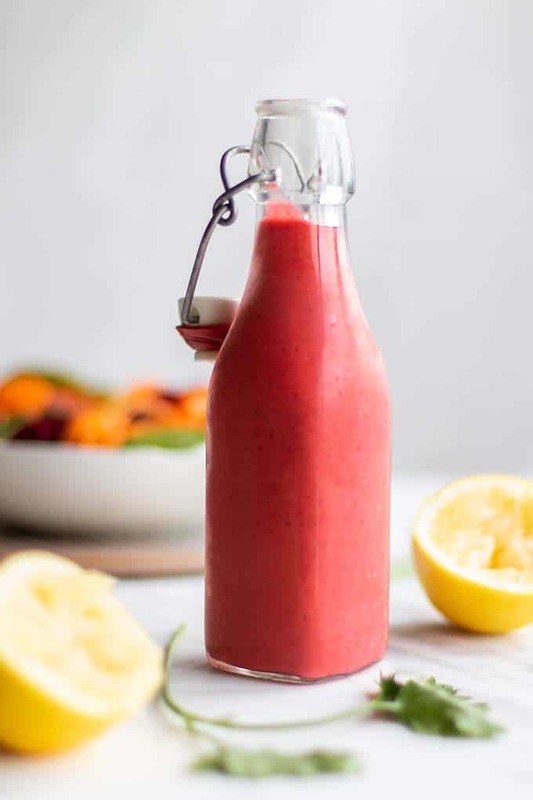 A simple 5 ingredient raspberry salad dressing that will make you crave salads this summer! I adore this drizzled on simple greens, but also use it as a topper for grilled meats and fish. Add all ingredients to a blender, and process until smooth. Drizzle over salads and grilled meats, or use as a veggie dip. 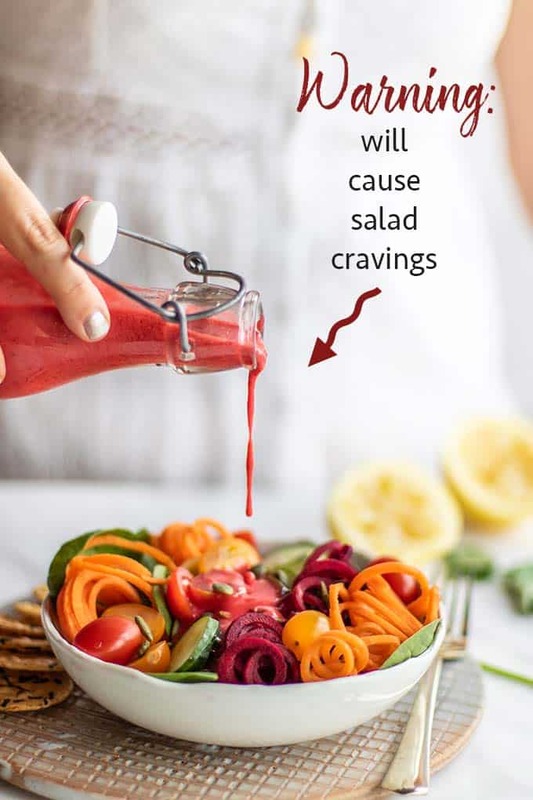 This Summer Raspberry Vinaigrette Dressing post contains affiliate links. If you click and make a purchase, I will receive a small percentage of the sale, at no additional cost to you. This helps keep Sunkissed Kitchen running and stocked with plentiful almond butter!